‘Jurassic World: Fallen Kingdom’: New IMAX Poster Delivers a Huge Bite!!! | Welcome to Moviz Ark! ‘Jurassic World: Fallen Kingdom’: New IMAX Poster Delivers a Huge Bite!!! IMAX and Universal unveiled a new poster for the upcoming release of Jurassic World: Fallen Kingdom. 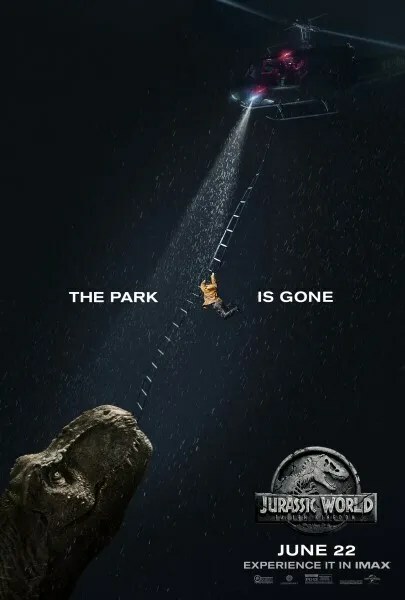 The IMAX exclusive poster sets the stage for the park which is in peril and features “Rexy”, one of the oldest dinosaurs to live in Jurassic Park, pulling a helicopter out of the sky… and possibly a human-sized snack right along with it. Starting June 22nd, audiences will feel every roar when they experience Jurassic World: Fallen Kingdom in IMAX, the most immersive way to return to Isla Nublar. The IMAX release of the movie will be digitally re-mastered into the image and sound quality The IMAX Experience with proprietary IMAX DMR (Digital Re-mastering) technology. The crystal-clear images, coupled with IMAX’s customized theater geometry and powerful digital audio, create a unique environment that will make audiences feel as if they are in the movie. Universal’s Jurassic World: Fallen Kingdom hits IMAX theaters on June 22. ← ‘Sanju’: First Look at Anushka Sharma in Sanjay Dutt’s Biopic Revealed!! Check It Out! !